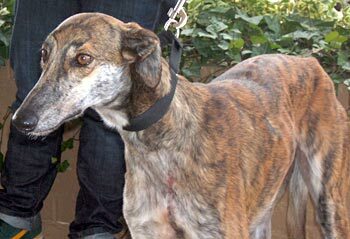 Lady is a petite brindle greyhound who is approximately 3 years old. 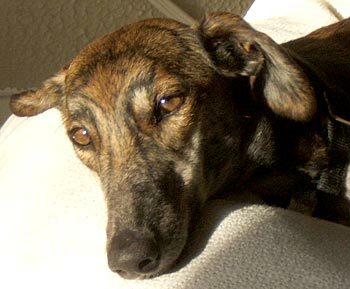 She was turned into the Ft. Worth Animal Control by her owner because he was not able to afford medical help for her. When Lady arrived, she had an infected deep wound below her throat area that appeared to have been caused from being impaled by an object. The wound is completely healed now, and Lady is ready to find her forever home! Lady passed her cat test with ease. She got a good sniff of the cat and had zero interest in him for the rest of her time here. Lady is the cutest little lapdog you've ever seen. She is still a little timid when meeting new people, but she doesn't take long to warm up to them. She loves to play "tag" with Dinger, my foster boy, by running from bench to bird feeder, around the house and back to the bench. It is one of the most comical things I've ever seen! It was determined that Lady had a bone fragment in her right elbow area. Dr. Ellis removed the rather large fragment on April 30th, stitches are out, and Lady is doing really well with putting pressure on her leg. 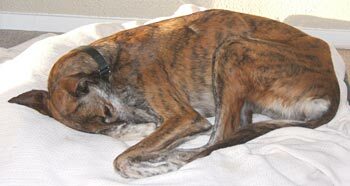 This little problem didn't hamper her ability to play tag with Dinger, but she isn't limping as badly now as she was prior to the surgery. She's a tiny girl and has such a rich red brindle coat. 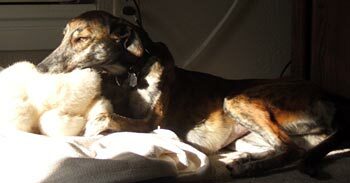 As you can see, she loves to sun herself in front of the window while resting her chin on one of her babies. She enjoys her attention, but she isn't pushy about it. She is a busy girl and likes to play with stuffed toys by tossing them around and tug-of-war with Dinger when she can get his attention with the right toy. Lady enjoys her rawhide and flip chips and actually tries to bury them under the dog beds or in between the pillows on the loveseat. This little girl has a great spirit and she is very inquisitive outdoors. She will happily chase squirrels and rabbits and has on occasion caught the rabbits. She is puzzled by how those darn squirrels can climb the tree that fast, but she is soon off for the next adventure.